This post was written by Maliheh Bitaraf. Maliheh is a graduate student at the Seton Hall School of Diplomacy and International Relations. Maliheh got her first Master’s degree in Mass Communication at Middle Tennessee State University (MTSU). Maliheh is a Media Associate at the Journal of Diplomacy and a UN Digital Representative at the Center for UN and Global Governance Studies. Maliheh specializes in International Organizations and Foreign Policy Analysis. This post was edited by Sheryl Steadman who is a graduate student in the School of Diplomacy and International Relations at Seton Hall University. Sheryl also has a Master’s in Public Administration and a Certificate in UN Studies, both from Seton Hall University. Sheryl is an Associate Editor at the Journal of Diplomacy and a UN Digital Representative at the Center for UN and Global Governance Studies. Sheryl specializes in International Organizations and International Law. Since March 2011, the Syrian conflict continues to pose a significant threat to U.S. national security interests and the Western world. 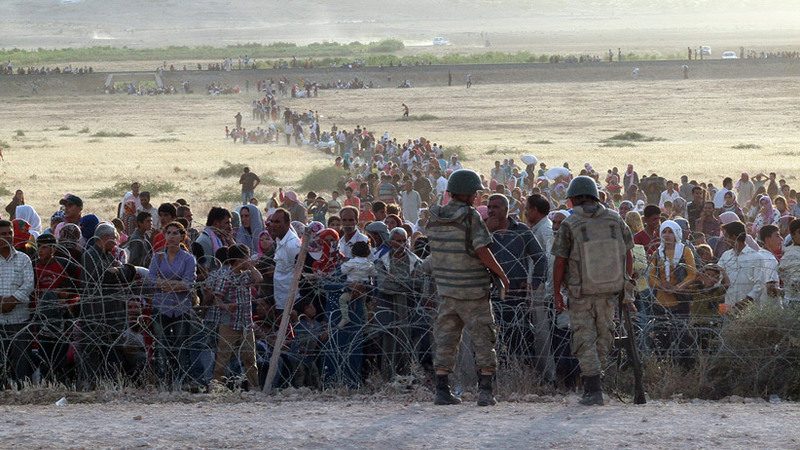 Over 10 million Syrians have been either internally displaced or have fled to other countries. Overall, more than 13.5 million Syrians, out of a total population of over 22 million are in need of humanitarian assistance. This is as a result of the conflict, which is considered the biggest world crisis since World War II. The Syrian refugee crisis and its spillover consequences impact Syrian citizens and the world in many ways, especially with refugee spillover both regionally and internationally. The crisis has created an estimated 6.5 million internally displaced persons (IDPs) within the Syrian (borders including 2.8 million children). And let’s be mindful that there is still an imminent threat of the spread of ISIS throughout the country. The regional spillover impacts Syria’s front-line States which are Lebanon, Jordan, Turkey and Iraq – they are bearing the brunt of the refugees escaping the conflict. Over 4.8 million people have sought refuge in the neighboring states. There is also a growing number of the Syrian population risking their lives to reach Europe through the dangerous trip across the Mediterranean Sea from Turkey to Greece. This international spillover of refugees has caused Europe to see the arrival of more than one million refugees seeking asylum in the year 2015 alone. One would argue that it is in the U.S. national security interest to help manage the growing Syrian refugee crisis. It could do so by lending political support to its Western allies because it would further stabilize its ties with them and would demonstrate its goodwill. Second, by providing political and financial support to its regional allies that take in refugees (particularly Jordan, Iraq and Turkey), the U.S. would help minimize spillover effects that could not only destabilize U.S. allies but also threaten their national security. Lastly, because the Syrian conflict poses no existential threat to American interests, its foreign policy strategy has been limited and slightly strategic in scope. But a failing state like Syria, with a large population of IDPs, can create a vacuum for terrorists’ groups to operate and improve their capabilities to penetrate the world. The U.S. non-intervention policy has proven not to be in its best interest. Since the inception of the Syrian war in 2011, the U.S. non-intervention policy has deteriorated the situation and caused more human rights abuses. However, take notice that Trump’s decision to launch a missile strike in Syria has proven not to be a non-intervention policy any longer. The United States also has an opportunity to support the United Nations’ 3RP Regional Refugee & Resilience Plan. The 3RP aims to address the war challenges by bringing together the vital efforts of some 270 humanitarian and development partners, in support of national effort to ensure refugees and host communities receive the support they desperately need. The U.S. should call on China (who has not provided any funds to Syrian relief efforts since 2014) in addition to calling on its Gulf Arab allies to make significant contributions to UN resilience efforts and to its international relief. Consequently, this would also help regional host states address both economic and political challenges. The U.S. could leverage its defense commitments in arms sales to Saudi Arabia so that that country becomes a signatory to the UN Convention on Refugees. It will allow for greater transparency in Saudi Arabia’s handling of Syrian refugees. According to the U.S. Department of Defense (DOD), Saudi Arabia and Qatar are expected to absorb costs to help the Syria Train and Equip Fund. One could claim that they may have the potential to provide more financial support to address the refugee crisis as well. Lastly, the U.S. could provide funds to the UN agencies such as FAO, WFP, UNHCR and other UN bodies contributing to the management of the refugees. It is evident that financial assistance could make the difference in bringing the conflict to an end. The data show that: 1- The U.S. has appropriated over $6.5 billion to respond to Syrian-related humanitarian crisis, and Congress has considered billions more to support economic development as well as security and stabilization initiatives in Syria and in neighboring countries. According to FAO, “Agriculture provides a lifeline for the millions of Syrians, including IDPs still living in rural areas.” 2- At the London Conference 2016, donor countries agreed on more funds than ever before to address the Syrian humanitarian response. The sum $6 billion for 2016 and further US D 6.1 billion were allocated for years 2017-2020. Seven years later, the Syrian conflict is still going on with no end in sight as of yet. Although efforts have made to assist the refugees have been copious, still more is needed. Being a student of International Relations, I know that much hinges on the strategy of the U.S., however, it is my hope that this country support the UN objectives that address the Syrian refugee crisis more fully in addition to leading the charge for global and regional players to significantly support and contribute to the UN-led efforts.